Disconnect battery negative terminal. Refer to PG-50, "Exploded View". Remove the rocker cover. Refer to EM-12, "Exploded View". Remove fender protector side cover (RH). Refer to EXT-27, "FENDER PROTECTOR : Exploded View". 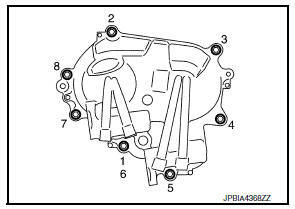 Support engine (1) and transaxle (2) using suitable jack (A). 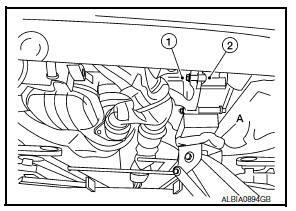 Position a suitable jack under the engine and transaxle assembly as shown. Do not damage the front exhaust tube or transaxle oil pan with the jack. Remove upper torque rod and engine mounting insulator (RH). Refer to EM-82, "M/T : Exploded View" (M/T) or EM-86, "CVT : Exploded View" (CVT). Rotate crankshaft pulley (1) clockwise and align TDC mark (no paint) (B) to timing indicator (A) on front cover. At the same time, check that the cam lobes of the No. 1 cylinder are located ( ) as shown. If not, rotate crankshaft pulley one revolution (360 degrees) and align as shown. Remove drive belt. Refer to EM-15, "Exploded View". Lock crankshaft pulley (1) using suitable tool (A), loosen crankshaft pulley bolt, and locate bolt seating surface at 10 mm (0.39 in) from its original position. Do not remove the crankshaft pulley bolt as it will be used as a supporting point for the Tool. Attach Tool (A) in the M6 thread hole on crankshaft pulley (1), and remove crankshaft pulley. Remove oil pan (lower). Refer to EM-33, "Exploded View". 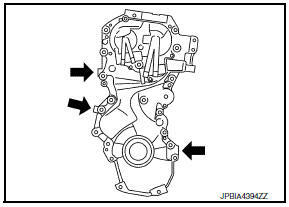 If crankshaft sprocket and oil pump drive component are not removed, this step is unnecessary. Remove intake valve timing control solenoid valve. Remove drive belt auto-tensioner. Refer to EM-16, "Exploded View". tool, and then remove the front cover. Be careful not to damage the mating surface. Remove front oil seal from front cover. Be careful not to damage front cover. Pull out front oil seal using suitable tool. Remove valve timing control cover, if necessary. Insert a stopper pin (A) into the top groove with the timing chain tensioner plunger pressed. Timing chain tensioner plunger is securely locked by inserting a stopper pin. 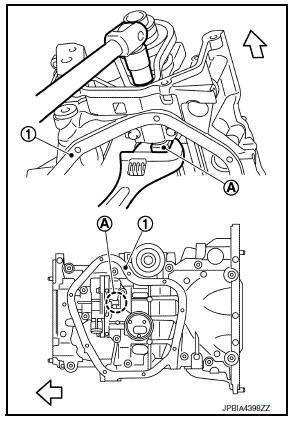 Remove timing chain tensioner (1). 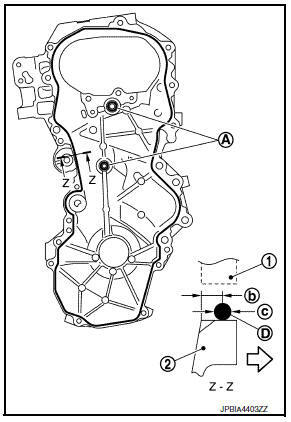 Remove slack guide (2), tension guide (3) and timing chain (1). 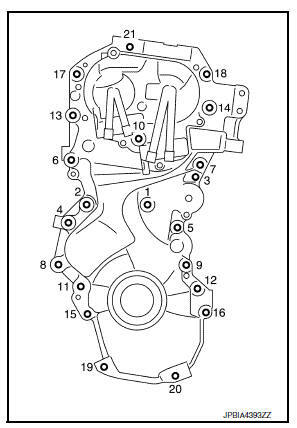 Do not rotate each crankshaft and camshaft individually while timing chain is removed. It causes interference between valve and piston. 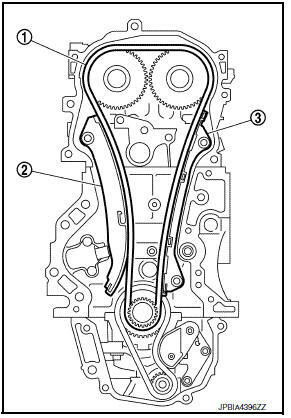 If timing chain is difficult to remove, remove camshaft sprocket (EXH) first to remove timing chain. 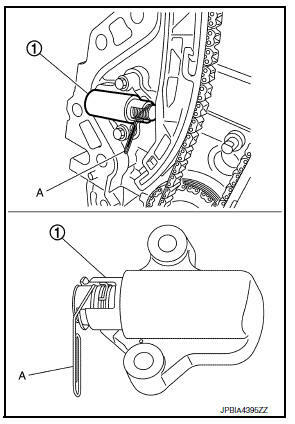 Push oil pump drive chain tensioner (1) in the direction as shown. Insert a stopper pin (A) into the body hole (B). Remove oil pump chain tensioner. When the holes on lever and tensioner body cannot be aligned, align these holes by slightly moving the oil pump chain tensioner slack guide. Hold the WAF part of oil pump shaft [WAF: 10 mm (0.39 in)] (A), and then loosen the oil pump sprocket bolt and remove it. Secure the oil pump shaft with the WAF part. Do not loosen the oil pump sprocket bolt by tightening the oil pump drive chain. The figure shows the relationship between the matching mark on each timing chain and that on the corresponding sprocket, with the components installed. Check that crankshaft key points straight up. 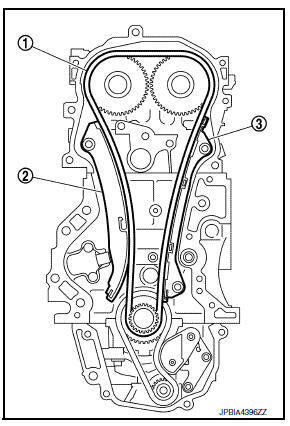 Install crankshaft sprocket (2), oil pump sprocket (3) and oil pump drive chain (1). Install it by aligning matching marks on each sprockets and oil pump drive chain. If these matching marks are not aligned, rotate the oil pump shaft slightly to correct the position. 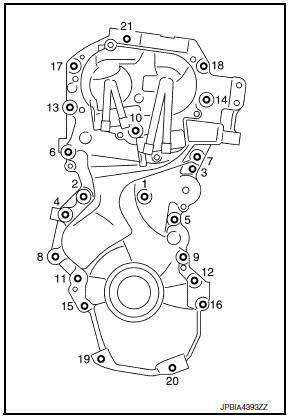 Check matching mark position of each sprocket after installing the oil pump drive chain. Hold the WAF part of oil pump shaft [WAF: 10 mm (0.39 in)] (A), and then tighten the oil pump shaft sprocket bolt. Do not loosen the oil pump shaft sprocket bolt by tightening the oil pump drive chain. Install oil pump chain tensioner (1). Fix the face of the oil pump tensioner at the most compressed position using a stopper pin (A), and then install it. stopper pin after installing the oil pump chain tensioner. 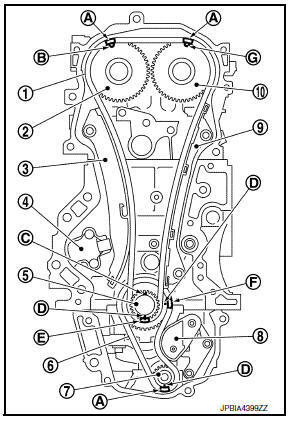 Check matching mark position of oil pump drive chain and each sprocket again. Align the matching marks of each sprocket with the matching marks of timing chain. If these matching marks are not aligned, rotate the camshaft slightly by holding the hexagonal portion to correct the position. Check matching mark position of each sprocket and timing chain again after installing the timing chain. Install the slack guide (2) and the tension guide (3). Lock the plunger at the most compressed position using a stopper pin, and then install it. Securely pull out the stopper pin after installing the timing chain tensioner. After installing tensioner on the cam side, pull out lock pin. To reuse tensioner on the cam side: After installation, pick up and move ratchet clip toward the tip of the plunger and position the tensioner parallel to the groove of the plunger. Install front oil seal. 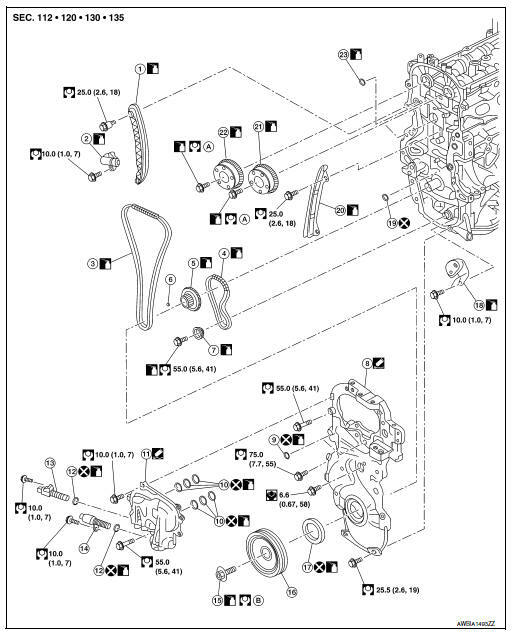 Refer to EM-70, "FRONT OIL SEAL : Removal and Installation". 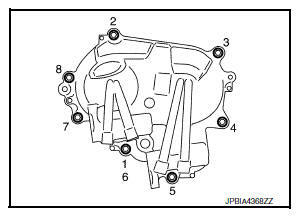 Install valve timing control cover, if removed. 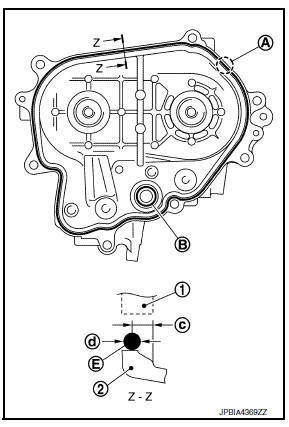 Apply a continuous bead of liquid gasket (E) using suitable tool to valve timing control cover as shown. The start and end of gasket application must overlap 5 mm or more with one another. Installation should be done within 5 minutes after applying liquid gasket. Tighten bolt the No.1 in two step. The numerical order No.6 shows the second step. Apply a continuous bead of liquid gasket (D) using suitable tool to front cover as shown. Check that matching marks of timing chain and each sprocket are still aligned. Then install front cover. 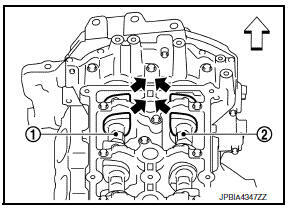 Check O-ring on cylinder block is correctly installed. Be careful not to damage front oil seal by interference with front end of crankshaft. Install front cover, and tighten bolts in numerical order as shown. Refer to the following for the installation position of bolts. After all bolts are tightened, retighten them to specified torque in numerical order as shown. Be sure to wipe off any excessive liquid gasket. When inserting crankshaft pulley with a plastic hammer, tap on its center portion (not circumference). Do not damage front oil seal lip. Secure crankshaft pulley (1) using suitable tool (A). Apply new engine oil to thread and seat surfaces of crankshaft pulley bolt. Put a paint mark (B) on crankshaft pulley (2), matching with any one of six easy to recognize angle marks (A) on crankshaft pulley bolt (1) flange. Turn another 60 degrees clockwise (angle tightening). Check the tightening angle with movement of one angle mark. Check that crankshaft rotates clockwise smoothly. 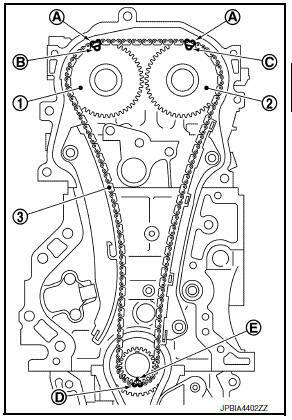 Check for cracks (A) and any excessive wear (B) at link plates and roller links of timing chain. Replace timing chain if necessary. Before starting engine, check oil/fluid levels including engine coolant and engine oil. If less than required quantity, fill to the specified level. Refer to MA-11, "Fluids and Lubricants". Use procedure below to check for fuel leakage. Turn ignition switch вЂњONвЂќ (with engine stopped). With fuel pressure applied to fuel piping, check for fuel leakage at connection points. Start engine. With engine speed increased, check again for fuel leakage at connection points. Run engine to check for unusual noise and vibration. 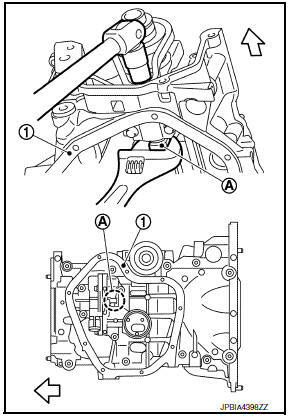 If hydraulic pressure inside chain tensioner drops after removal and installation, slack in guide may generate a pounding noise during and just after the engine start. However, this is normal. Noise will stop after hydraulic pressure rises. Warm up engine thoroughly to check there is no leakage of fuel, or any oil/fluids including engine oil and engine coolant. Bleed air from lines and hoses of applicable lines, such as in cooling system. After cooling down engine, again check oil/fluid levels including engine oil and engine coolant. Refill to the specified level, if necessary. *: Power steering fluid, brake fluid, etc.